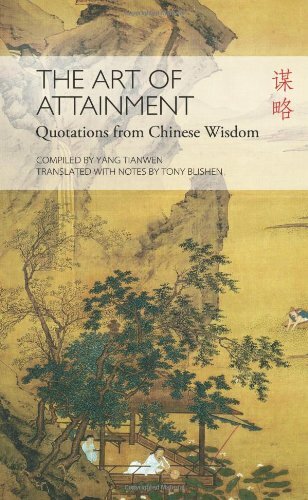 A review of The Art of Attainment: Quotations from Chinese Wisdom, compiled by Yang Tianwen, translated with notes by Tony Bushen. Shanghai: Shanghai Press and Publishing Development Company, 2012. People as the Basis: “A state cannot stand without the confidence of the people.” Confucius. Benevolent Government: “Where justice prevails over personal advantage there is order, where advantage defeats justice there is confusion.” Xunzi. These tidbits should be enough to whet your appetite. Not only China’s new leaders, but all those who wish to understand the Chinese mind, would do well to ponder these lessons from several thousand years of careful reflection.